99 Stats Until Kickoff: Can an NFL season be saved after an 0-2 start? Two weeks does not an NFL season make. However, losing both games the first two weeks of a new season has not been a good omen over the past few years. In 2012, six teams started the season 0-2. 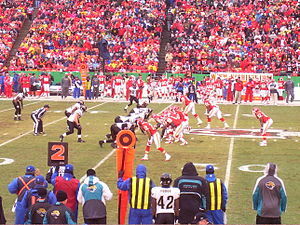 Of those teams, the Kansas City Chiefs also started the 2011 season 0-2. Two teams, New Orleans and Oakland, had not been 0-2 after Week Two since 2007. The other 0-2 teams were Cleveland, Jacksonville and Tennessee. In 2011, seven teams started the season 0-2. None of those teams made the playoffs. The same thing happened in 2012; none of the six teams that started 0-2 made the 2012 playoffs. In fact, no team that started the season 0-2 has made the playoffs in the last four seasons (more on that in a moment). All seven of the 2011 teams that started 0-2 finished the season under .500; all six of the 0-2 teams from 2012 also finished under .500 for the season. The Denver Broncos are the only NFL team that has not gone 0-2 this century. The Broncos last started a season 0-2 in 1999. Following is the last season in which each NFL team started 0-2. Note: Of the 84 playoff teams from the seven seasons spanning 2006-2012, 36 were 2-0 to start the season that playoff year, 43 were 1-1 and only five started 0-2 and made the playoffs. Last year, of the 12 playoff teams, three (Atlanta, Houston and San Francisco) started the year 2-0 and nine split their first two games.